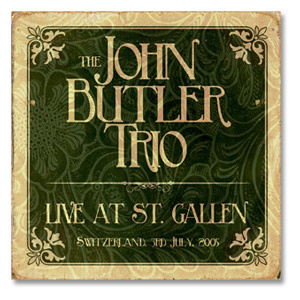 The John Butler Trio Live at St. Gallen, a very special limited edition double live album, will be released March 28, 2006. Live At St. Gallen captures the Australian band's amazing performance July 3, 2005 at the famed St. Gallen Open Air Music Festival in Switzerland. "So this is what we got up to when we were away from our beloved Australian family, spreading the love and stories. Here we are on a good day (warts and all), with an awesome audience, great vibe and beautiful setting. All in all a special moment which we wanted to share with you seeing as we've been away so long," comments Butler.